The rice genome. The grape genome. The original human genome project. You name it, Bonnie Hurwitz probably worked on it in her 12 years as a computational biologist in industry, where she combined her loves for genomics and computer programming. Hurwitz, assistant professor of biosystems engineering and BIO5 Institute fellow, came to the University of Arizona in 2008 for a Ph.D. in ecology and evolutionary biology. She zipped through the program in just four years—and she had a baby in the middle of it. Her daughter, born eight hours after Hurwitz's comp exam, has influenced her mother's research as a UA faculty member. "I'm interested in the intricate pathways in microbes that govern how life works," Hurwitz said. "Microorganisms live symbiotically with us and form a kind of microbial superorganism that prevents pathogens from getting through our skin and into our systems." Hurwitz, who also chairs the UA's Research Computing Governance Committee and teaches interdisciplinary classes in genetics, statistics and computational biology in biosystems engineering, works in metagenomics, or the sequencing of the whole communities of microorganisms within a sample. Like humans, microbes don't operate in a vacuum: They're affected by their communities of fellow microbes and the environment they live in. When a doctor swabs a patient's infection, the swab contains the bacteria from the infection, but it also has bits of human DNA and other organisms mixed in. Using a process called "whole genome shotgun sequencing," scientists such as Hurwitz sequence the entire sample in an effort to understand how communities of organisms work together. Sometimes, for example, viruses can completely re-engineer the role of bacteria. "When they do, they can change the function of their bacterial hosts, which can in turn influence biological processes in the environment or bodies," Hurwitz said. "These microscopic organisms play an important role in our lives that many people don't appreciate." We don't appreciate them, of course, until something goes wrong. When Hurwitz first started her research position at UA, her daughter developed a chronic ear infection that didn't respond to antibiotics. Looking for an answer, Hurwitz decided to swab her daughter's ear herself and send the sample off for sequencing. The cause was a soil bacterium that is not susceptible to antibiotics and doesn't grow in a petri dish, making it undetectable by the clinical microbiology lab. The solution wasn't antibiotics; minor surgery resolved the problem. Her daughter's case was relatively simple. 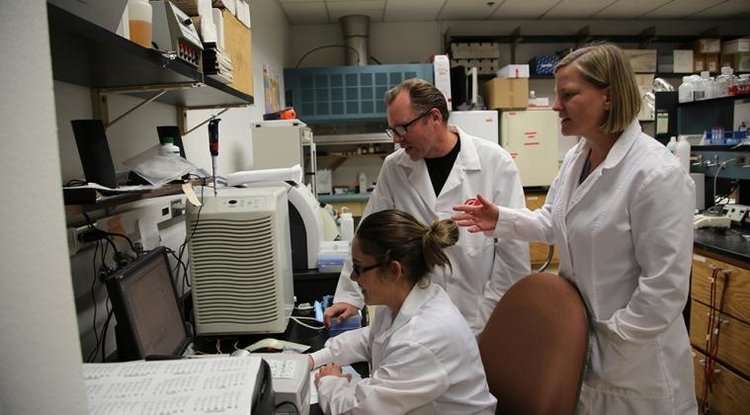 In the Hurwitz lab, researchers often work with immune-compromised patients who are affected by atypical pathogens—ones that don't grow in petri dishes. The only way to examine these pathogens is to sequence their DNA and compare the data to a repository of known microbes, sometimes creating sequences for entirely new microbes. Even when drawing these comparisons, similarity in genome sequences doesn't always equate to clinical significance. E. coli and Shigella, for instance, have almost identical genomes, but a tiny difference in the Shigella genome means it causes dysentery. Other microbes, such as M. schaedleri, are normal parts of a healthy gut but have been associated with colorectal cancer when they become overabundant. "We care about not just who's there but how much, and how these microorganisms are spun together into complex communities," Hurwitz said. "Why do certain organisms coexist with one another? How does that change given different perturbations to either human health or the environment? And how can we take that information and put it into something that's useful for humankind?" That's why Hurwitz and George Watts, a research assistant professor in pharmacology, are working on a whole genome shotgun sequencing. By examining the functional composition of the entire microbial community, scientists can identify the most appropriate treatment for one person, which may translate to other people with sufficiently similar microbial communities. "Dr. Hurwitz has a great vision for where she wants the field of viral metagenomics to go," said Jana U'Ren, an assistant professor in biosystems engineering whom Hurwitz met in grad school. "Her expertise in big-data analytics makes seemingly impossible analyses doable, and she is always pushing the limits." Hurwitz is more modest, comparing the process to Amazon's "frequently bought together" feature. "Hey, you have this particular microbial community. Others like you have taken this antibiotic and been successful, or others like you have moved on to other severe interventions such as surgery," she said. In her metagenomics research, Hurwitz works with cellular and molecular medicine professor Dr. Thomas Doetschman researching colon cancer, with UA chief of vascular surgery Dr. We Zhou studying diabetic foot ulcers and with Dr. Valentine N. Nfonsam from the College of Medicine's Department of Surgery on colorectal cancer. Her lab also heads several other projects involving cyberinfrastructure and sequencing algorithms. "Not only is she one of the top metagenomic researchers, but she sees the benefits that computation and computational thinking can bring to metagenomics, and she has the expertise in computer science to bring the two disciplines together," said John Hartman, an associate professor in the College of Science who has shared several grants with Hurwitz. The ultimate goal in her genomics work is for doctors to be able to sequence samples from patients, to offer quick diagnoses and treatment plans. "The research I do is not esoteric. It's meant to be applied," Hurwitz said. "We're working toward taking next-generation sequencing out of the research realm and into practice."